My friend Let ( click on her name) who has a wonderful blog, and is multi talented like most of you all. She recently did some wood burning for jewelry. I do dabble in this when I make my bunny shuttles, but never very large projects. I see Let only on the Internet, with our blogs and Pinterest we run into each other. Make tiny dots to start cause the hot burner will slide too fast and get away from you! Now I am ready for cooking. This wood burning is called "Pyrography" there are many beautiful spoons out there on Pinterest! Suzanne, and then Margaret Have a wonderful day what ever you are up to! I keep my mistakes with tatting and then try to use them. This mistake is forming an idea for a journal cover or purse or something along with this brooch. Got to sleep on it more. Asparagus. I got to eat him or cover him up in a while, because there will be more cold weather, I am sure of it. Scarlet O'Hara Tatted Lace Too! Any woman born in American between 1940 and 1980 has seen this move multiple times. At least that's my personal opinion. War that almost divided a nation and freed slaves fought brother against bother and so on , I had to make her place her hand on her mouth. This is a 1940's movie that actually references tatting miles of lace with her friends, and is from a book that wrote about a time during the civil war 1061 to 1865. I did write down a couple of famous quotes from the movie that I have said or herd on many occasions. 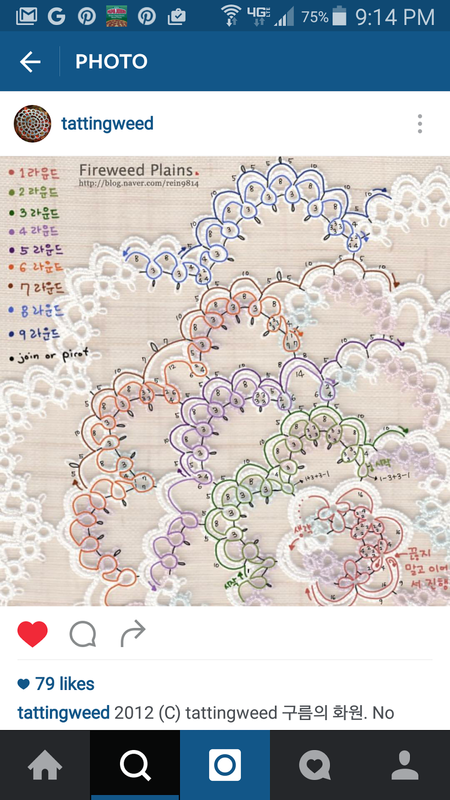 Below is a bit of a late Start on the newest spring doily from Renulek's Blogspot and I hope you all will enjoy her latest get pattern by clicking on her name above. And I received these beautiful shuttles from Veronica from St. Petersburg Russia they are larger I only own one shuttle larger that this and I can actually tat with them and I have small hands too :) I do enjoy different kinds of shuttles and yes I find it fun to adapt to each one. I did get tired of winding these though and I have tons of thread on there and feel I could make the whole doily without loading the shuttles again. Lets see how far get with these "puppies"
" I'll think about it tomorrow, tomorrow is another day"
You Pick any Square, and I chose one from this book by Myra Piper, called Tatting. Below is a fun video that shows just the square. 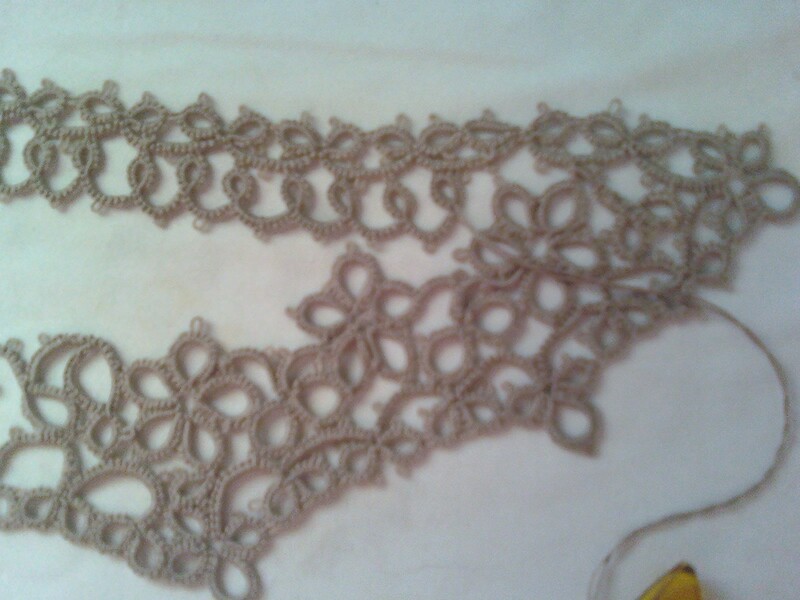 After all the tatting I have done this is most satisfying cause I wear it a round and people get to see it. After taping a flimsy pattern ( store bought) together at seams and cutting off the seam allowance, I drew it out on large white paper. This way tatting can be pinned down and take up again as you tat. 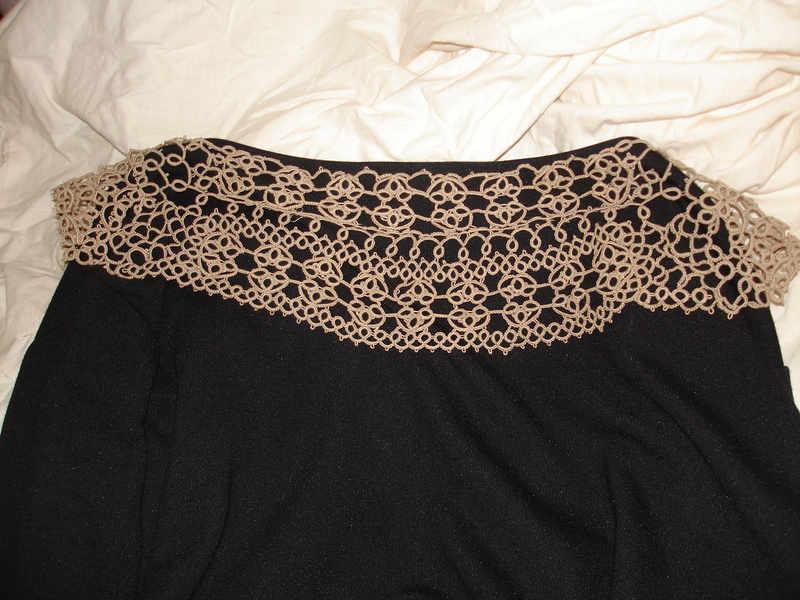 ( Or purchased flat lace stitched together). 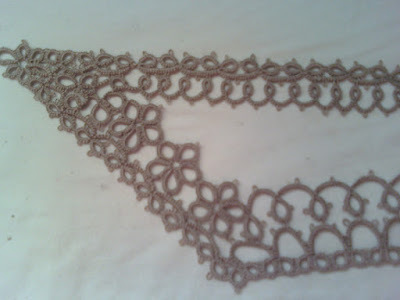 With tatting at this point, you could choose an any edging you want. 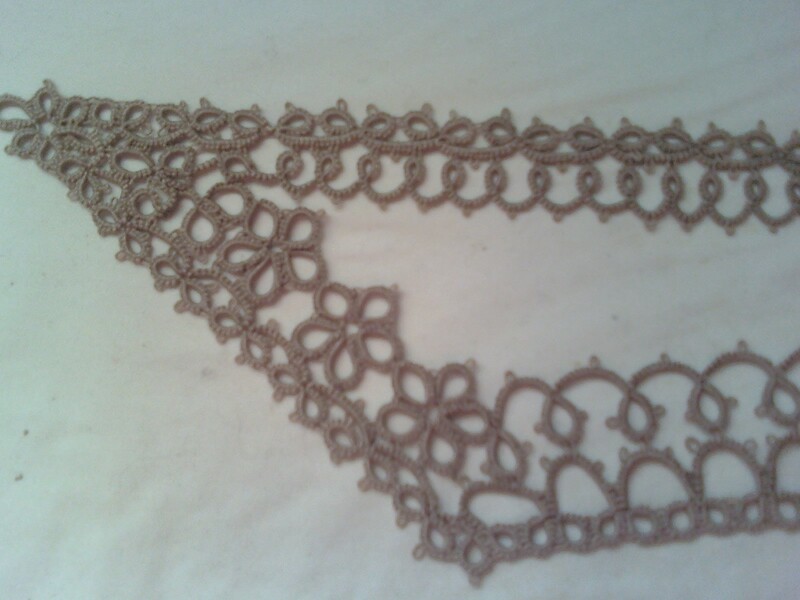 Tatting a boarder all the way around is next step, the shaping of the corners was the hard part, but after all I only had to make two corners work and *squishing it at half way point wasn't so bad. Once around, add filler tatting and pinning down to check size as you go. The biggest tip that I have given tatters creating any pattern is don't worry about picots (put them in normal places or not at all) *when you need to connect tatting with no picot to attach to, use a tiny hook and insert thread of the current ring or chain, between any double stitching, and write down what number you are at, so when you do the other side it will look the same. This increases creative time so you don't have to re-tat over and over ! 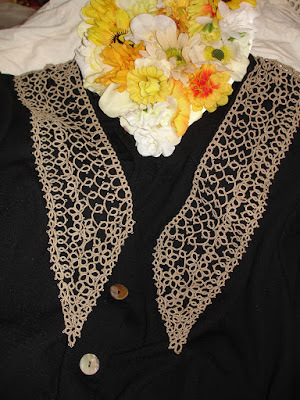 I Think I may have posted this collar before, it was made several years ago, but never explained how this is done till now!